MILWAUKEE — As dominant as Jaime Garcia had been lately, the Cardinals’ prospects of winning the series against the Brewers certainly looked good heading into the finale. Add his 2-1 record with a 1.08 ERA against the Brewers this season with just three earned runs allowed on 20 hits and it would seem everything was in place for St. Louis to head out of town on a winning note as they looked to stay in the National League playoff hunt. Instead, Garcia delivered the worst starting performance of his career, as the Cardinals lost, 8-1, on Wednesday for a tough road series loss after taking the series opener on Monday. With their lineup, the Brewers were bound to rough up Garcia eventually. But with the way the rookie left-hander had shut them down in four previous starts, it would have been hard to predict they’d hand him his worst outing of the season. “Obviously, they have a great lineup and good team,” Garcia said. “It was just one of those days that I tried to do too much. Entering the game, the Brewers had scored just seven runs — three earned — on 20 hits in 25 innings against Garcia with 22 strikeouts against 10 walks. They doubled their run total on Wednesday, putting up seven runs on seven hits in just four innings. “Tonight might have been the result of being more aggressive,” said left fielder Ryan Braun, who drove in four of the Brewers’ eight runs. “When you’re aggressive and putting pressure on the other team, it seems to be advantageous. A couple of those mistakes — two walks — played integral roles in the Brewers’ big innings. With one out in the third inning, Garcia walked Rickie Weeks, who stole second base. One strikeout later, Garcia surrendered three straight hits, an RBI single by Ryan Braun, a Prince Fielder ground-rule double and a two-run single by Casey McGehee. An inning later, it was much the same story. After shortstop Alcides Escobar led off with a single, Weeks walked again, with two outs this time, to spark the Brewers. Right fielder Corey Hart followed with a single, scoring Escobar, and Braun blasted a three-run homer just over the wall in center field. “That was completely, 100 percent my fault,” Garcia said of the home run. “[Pitching coach Dave] Duncan went out there and told me we need to do something with sinkers and I threw a changeup. Garcia’s line marked a career-worst outing for the rookie. Garcia had surrendered as many as eight runs in a game on Aug. 3, but only four were earned. His previous high in earned runs allowed was five. “I think he was just in the middle of the plate,” said Cardinals manager Tony La Russa. “He had good stuff through a lot of it, but if you look at the pitches that they hurt him on for runs, he just got the ball in the middle. The disappointing outing by Garcia only added to what has been a rough start to a crucial road trip for the Cardinals. With the Reds losing to the Rockies on Tuesday and Wednesday, the Cardinals could potentially have gained two games in the division race with wins. Instead, they remain six games behind Cincinnati in the NL Central with 25 to play. All eight of the Brewers’ runs on Wednesday and 16 of their 18 runs in the series scored with two outs. For Garcia, shutting down opposing hitters with two outs had been a strength before Wednesday’s rough outing. Garcia certainly deserved some blame for Wednesday’s loss, but his counterpart kept the Cardinals’ offense quiet for the second straight night. Left-hander Chris Capuano tossed seven strong innings, giving up just one run on four hits while not allowing a walk. Capuano (3-3) also struck out two batters. The Cardinals’ only run on the night came from Albert Pujols, who went 2-for-3 with a solo homer and a double. Colby Rasmus and rookie Matt Pagnozzi were the only other Cardinals to reach safely against Capuano, with Pagnozzi picking up his first career hit. It was yet another poor offensive night for the Cardinals against a soft-tossing lefty, which is starting to become a troubling theme. MILWAUKEE — After being recalled from Triple-A Memphis a week ago, catcher Matt Pagnozzi got his first Major League start behind the plate on Wednesday against the Brewers. “Pagnozzi knows [Jaime] Garcia, so that helps,” said manager Tony La Russa. Pagnozzi, who is a nephew of former Cardinals Gold Glover Tom Pagnozzi, has spent each of the past two seasons with the Memphis Redbirds before being called up in September. In 2009, each of the final five games of the season saw Pagnozzi enter in the late innings. In those five games, Pagnozzi did not record a hit in three at-bats, while walking once and reaching base on an error. In the season’s final game, Pagnozzi scored a run in the Cardinals’ 9-7 loss to the Brewers at Busch Stadium. Pagnozzi recorded his first big league hit during the fifth inning on Wednesday. In 68 games for Memphis this season, Pagnozzi batted .242 with a .338 on-base percentage and a .309 slugging percentage with one home run and 21 RBIs. Not known for his offense, Pagnozzi is a better defensive catcher than fellow rookie Bryan Anderson. With better offensive numbers and improved defense, Anderson overtook Pagnozzi as the Cardinals’ top backup catcher. MILWAUKEE — With left-handed starter Chris Capuano on the mound on Wednesday for the Brewers, Cardinals manager Tony La Russa went with a mostly right-handed lineup. The only left-handed hitters were Colby Rasmus and starting pitcher Jaime Garcia. Included in it was Tyler Greene, who started at second base for the first time since July 3 and batted leadoff for the first time since May 4. The move was particularly interesting considering switch-hitter Felipe Lopez has a career .462 average against Capuano with one home run and two walks. Greene, on the other hand, has never faced Capuano. The decision came down to Lopez’s recent struggles outweighing past success against Capuano. In his past 75 at-bats, Lopez has recorded just eight hits. On the season, Capuano has held lefties to a .220 batting average while right-handed hitters have posted a .290 mark against him. With Capuano’s splits and Lopez’s past numbers in mind, did La Russa consider starting his struggling second baseman? MILWAUKEE — It may be hard to believe, but Wednesday marked the 12th anniversary of Cardinals hitting coach Mark McGwire breaking Roger Maris’ home run record with homer No. 62 on Sept. 8, 1998. With two outs in the bottom of the fourth inning, McGwire blasted the first pitch he saw from Cubs starter Steve Traschel out to left field, where it barely cleared the fence. All that mattered was that it went out, though, as the homer sparked a memorable on-field celebration. McGwire’s blast broke Roger Maris’ single-season record of 61 home runs, which had stood since the 1961 season. Over the final 18 games of the 1998 season, McGwire added eight more home runs, finishing with a then-record 70 homers. In the 12 years since that thrilling season, McGwire has seen his record broken by Barry Bonds in 2001, admitted to steroid use during his career and assumed the role of hitting coach at the start of this season. Left-handed reliever Trever Miller underwent an MRI scan in St. Louis on Wednesday, which revealed a forearm strain. He is considered day-to-day. … Third baseman David Freese underwent a procedure today in Colorado for a debridement of his left ankle. He will begin therapy this week. ST. LOUIS — With right-hander Adam Wainwright on the mound Wednesday for the Cardinals, center fielder Lorenzo Cain didn’t expect to see his name in the Brewers’ lineup. When the rookie saw his name in the lineup, his excitement for the series finale increased significantly. “I saw I was in the lineup, and I was like, ‘Wow, I’m facing Wainwright,'” Cain said after Milwaukee’s 3-2 win. “I got excited for that and just tried to go up there and get the job done. Entering the game, right-handed hitters had been hitting .202 off Wainwright, compared to a .214 mark for lefties. Cain went 2-for-3 on the day, with a leadoff double in the fifth and an RBI triple in the seventh inning. Cain followed his double with a steal of third base, which proved crucial when he scored on a soft grounder back to the pitcher by George Kottaras. After the triple, Cain scored the eventual game-winning run on an Alcides Escobar sacrifice fly. Even Cain’s second-inning out was hit hard, as Wainwright snagged a liner back to the mound before doubling off Prince Fielder at first to end the inning. “He has got some talent. No doubt,” Wainwright said of Cain. “I thought I made a good pitch, and he drove it to the right-center gap. Put a good swing on it. Along with Cain, fellow rookie Escobar was in the lineup for the Brewers on Wednesday, despite having struggled against Wainwright. Making the move more surprising was the success veteran infielder Craig Counsell had against Wainwright in his career. Counsell entered Wednesday’s series finale at Busch Stadium with a .304 (7-for-23) batting average against the Cardinals right-hander. Escobar, on the other hand, was hitting just .167 (2-for-12) against Wainwright. Escobar’s day didn’t go quite as well as it did for Cain, but was still successful, as the rookie shortstop finished 0-for-1 with a strikeout and the game-winning sacrifice fly. More significantly, though, Escobar left the game in the ninth with cramps in his hamstring. After hustling to catch a throw from Corey Hart in right field, Escobar’s day was done. According to manager Ken Macha, the idea of putting Cain and Escobar in the lineup had more to do with the future of the club and the development of the two rookies than trying to win the two-game series from the Cardinals. Considering the two accounted for all three runs on the day against Wainwright, the initial results were promising for the Brewers. MILWAUKEE — If you were at County Stadium on that late October day in 1982, you might never guess the celebration was for the World Series runners-up. 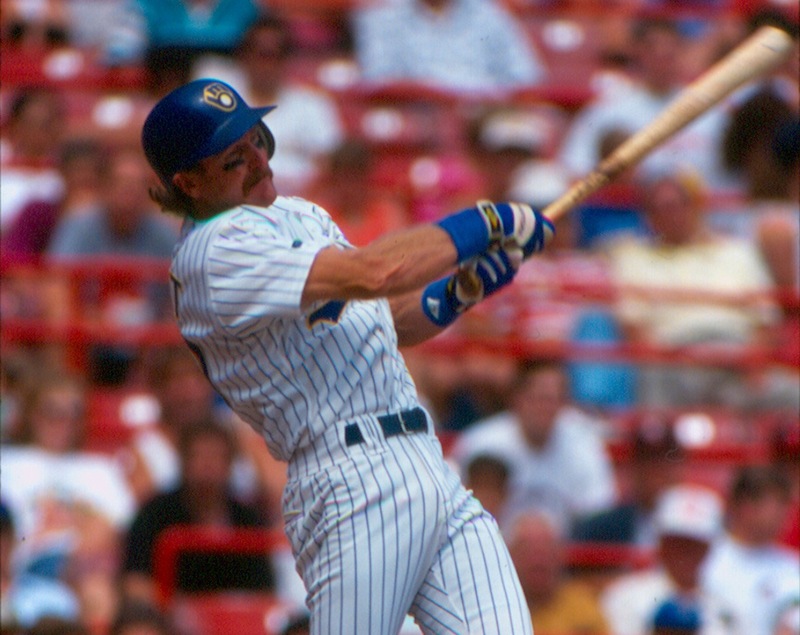 When Robin Yount circled the warning track at County Stadium on a Harley Davison motorcycle, the crowd of more than 20,000 fans was thrilled for the return of their beloved Milwaukee Brewers. To this day, the Brewers’ 1982 team is adored by fans for giving Milwaukee its first World Series since the Milwaukee Braves won back-to-back National League pennants in 1957-58. After finishing the previous decade with what remains the club’s best record to date in 1979, the Brewers enjoyed their greatest success of any decade in the 1980s, finishing .500 or better five times while reaching the playoffs twice and making the franchise’s only World Series appearance in ’82. This weekend, as a part of the 40th anniversary of the move from Seattle, the Brewers are celebrating and reflecting on the club’s second decade in Milwaukee. On Friday, the team will wear reproductions of its 1978-89 uniforms, highlighted by pinstripes with “BREWERS” block letters on the front and the ball and glove logo on the cap. The Mariners will wear light blue road uniforms worn from 1981-84. On Sunday, all fans in attendance will get a bobblehead doll commemorating Cecil Cooper’s base hit to drive home the winning runs in Game 5 of the 1982 American League Championship Series. While nearly everyone’s first thought of great Brewers teams goes immediately to the 1982 squad, the 1981 team was impressive in its own right. With a 62-47 record, the Brewers finished with the best overall mark in the AL East and earned a playoff berth for their second-half record due to the split schedule that season caused by the players’ strike from June 12 to Aug. 10. But while the Brewers lost the division series to the Yankees, three games to two, the 1981 season is remembered fondly by the players involved. “That was probably our best team, we just jumped out in front and never looked back,” said Rollie Fingers, who won the AL MVP and Cy Young Awards in 1981. “It was a shame we had the strike in the middle of it, but it may have helped me. Following the club’s first-ever playoff appearance in 1981, expectations were high for the Brewers in 1982. Through the season’s first two months, however, things did not go as planned. After the Brewers struggled to a 23-24 record on June 1, manager Buck Rodgers was fired in favor of Harvey Kuenn. With that, Harvey’s Wallbangers were born. Over the last four months of the season, the Brewers went 72-43 to finish first in the AL East, one game ahead of the Baltimore Orioles. After losing in the division series the year before, the Brewers returned to the playoffs for the second time in franchise history. As they squared off with the California Angels in the AL Championship Series, the Brewers immediately dropped the first two games of the series in Anaheim. But as the series returned to Milwaukee, the Brewers swept all three games at County Stadium, including a thrilling 4-3 victory to clinch the AL pennant. Milwaukee loaded the bases in the bottom of the seventh, which led to the most famous single of Cooper’s career, a two-run hit that put the Brewers on top and won the series. After winning the ALCS, the Brewers were set to face the St. Louis Cardinals in the “Suds Series,” the first World Series in club history. Though they fell short in Game 7, the 1982 season remains fresh in the memories of players and fans alike. But the Brewers would not make it back to the playoffs in the 1980s. Despite having much the same ballclub as the previous two seasons, the Brewers dropped from first in the AL East in 1981-82 to fifth in ’83, seventh in ’84 and sixth in ’85 and ’86. In looking back, Yount sees a distinct difference between the successful clubs of the 1981-82 seasons and those that never made it back to the playoffs in the years following that success. When asked if it was disappointing not to make it back to the playoffs in his career, Yount did not hold back his feelings on the matter. Though they still would not reach the playoffs over the decade’s final three seasons, the 1987 team would provide plenty of memories. And all within the first two weeks. To open what turned out to be a wild and wacky season, the Brewers tied a Major League record, winning its first 13 games of the year. One month later, the club lost 12 in a row. But the 13-game stretch to open the season is among many Brewers fans’ favorite memories. Along the way, two highlights stand out. First, in the team’s ninth game of the season, lefty Juan Nieves tossed the first no-hitter in franchise history, blanking the Orioles on April 15, 1987, at Memorial Stadium in Baltimore. Nieves became the first Puerto Rican-born pitcher to toss a no-hitter, but he couldn’t do it without a little help from Yount, who made a tremendous no-hitter-saving catch in center field for the 27th and final out. Three days later, the current Brewers hitting coach delivered the most famous home run in Brewers history, on Easter Sunday no less. With the winning streak on the line, the Brewers headed to the ninth down, 4-1. At that point, the might have Brewers thought it was over, as did their fans. With that in mind, the crowd of 29,357 gave a standing ovation in appreciation for the 11-game win streak. With two on and one out, slugger Rob Deer crushed a 1-0 curveball out to left, tying the game at 4-4. Rookie B.J. Surhoff followed Deer with a strikeout, but after a walk was drawn by Gantner, the switch-hitting Dale Sveum had a chance to make it 12 in a row. With a full count, Sveum got a cut fastball, waist-high over the middle of the plate. Sveum jumped on it and blasted a two-run walk-off homer, sending County Stadium into a frenzy, as the Brewers had won their 12th straight to start the season. Later that season, Paul Molitor drew national attention when he hit in a team record 39 straight games. It remains the seventh-longest hitting streak in big league history, and fifth-longest since 1900.